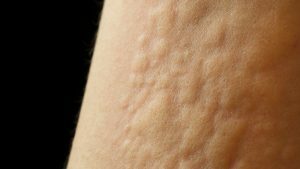 Itchy welts that may appear anywhere on the skin, Hives — medically termed Urticaria (ur-tih-CARE-ee-uh) — may vary in size from a few millimeters across to several inches or more in diameter. Hives may connect from one to another, effectively forming on large “chain” of, or a “blended,” hive. 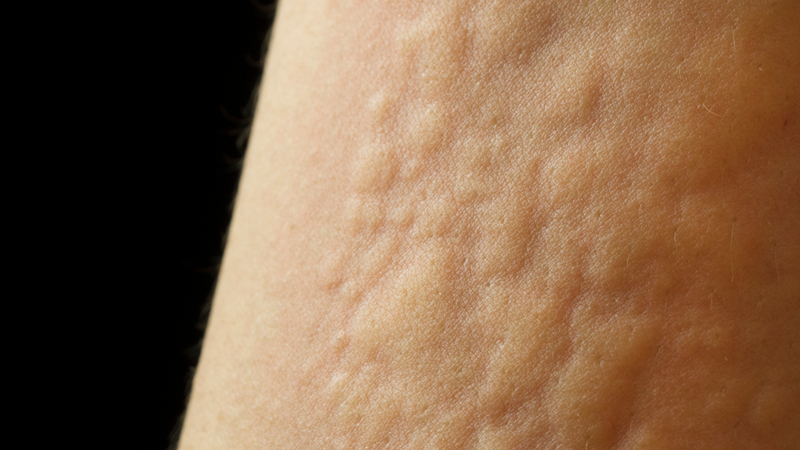 Most often, a case of hives does not last for more than several weeks. Chronic hives may last longer and often are part of an underlying condition. Hives are often an allergic reaction to something, but they may be do to various things and often go away within 24 hours, although new hives may replace old ones for some time. Please contact our office if you are having a problem with hives. We can often make same-day appointments for patients. If eyelids or the mouth swell with hives, emergency care should be sought immediately.